Although I'm a first quarter Boomer, I still have a regular job and travel a fair bit. My home airport is IAH (look it up if you don't know airport codes). A week ago Sunday, I had to go to Atlanta for a few days. Well, I'm one of the lucky ones who regularly gets massages from TSA when going through security at the airport. Lucky in that, without the orthopedic surgery available today, I'd have an arm and a leg that didn't work - had a hip replacement in '99 and a shoulder replacement in '04. All that titanium drives the metal detectors crazy. TSA: OK, before we start, I've got two quick questions. TSA: Do you have a pacemaker? TSA: Stand there facing your things, feet apart, arms out, palms up. By this time, I had pretty much concluded that the second question wasn't coming right away. Or, maybe he asked the two so quickly that I mistook it for just one. TSA: (Wand beeping continuously as he waves it around my titanium shoulder) This the replacement shoulder? Then, he starts on the legs. Checking around my right hip, with no beeps. TSA: Is this the hip? TSA: (Checking left hip) Is this it? Me: (Thinking, look, I only have two, and it wasn't the other one, so whadaya think? Use the process of elimination here.) Yes. We finally finished and, after putting on my shoes and belt, stowing my laptop, making sure I had my pen, reading glasses (another Boomer affliction), gum, change(usually don't travel with change for just this reason), phone and blackberry, I was on my way. OK, so that was outbound on Sunday. However, I wasn't done with TSA fun quite yet. Wednesday afternoon, going through beautiful Atlanta Hartsfield airport (I really dislike that airport!) I finally get up to the security screening area. 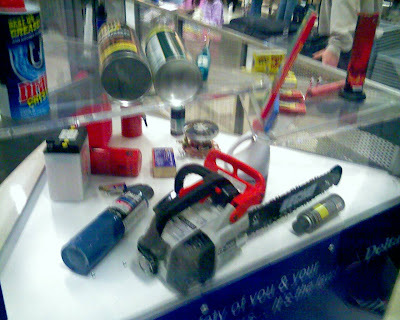 They have an extremely helpful display there to provide some good examples of what you can't carry onto an airplane these days. Who woulda thought? If I can now figure out how to add a photo, you can see this for yourself. OK, that was pretty easy. Yup, that's a chainsaw. Blowtorches, gas can - can't carry any of this stuff aboard. So, on the way back to Houston (that's IAH) I flew completely at ease and assured of a high level of security, confident that I wasn't going to be attacked by a chainsaw wielding maniac.